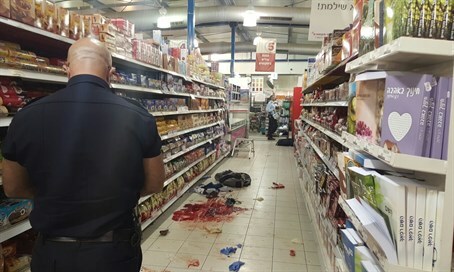 14-year-old Arab terrorists murder man in Rami Levy supermarket stabbing, second victim moderately wounded. Two Arab terrorists conducted a stabbing attack late Thursday afternoon at a Rami Levy supermarket at the Sha'ar Binyamin Industrial Zone in Samaria, located just northeast of Jerusalem. Two people, one aged 36 and the other 21, were wounded in the attack, one critically and the other moderately with both suffering stab wounds to the upper body. The 21-year-old victim later succumbed to his wounds. Magen David Adom (MDA) teams provided treatment to the victims at the scene prior to evacuating one to Hadassah Mount Scopus Hospital and Shaare Tzedek Hospital in Jerusalem. Shaare Tzedek's trauma unit reported it received the 21-year-old male victim from the attack, who was in serious condition and unconscious. The medical team struggled to save the young victim's life, but eventually were forced to pronounce his death. Hadassah Mount Scopus reported the 36-year-old victim as in moderate condition, stable and fully conscious. The two attackers were both shot by armed civilians and neutralized. Both were identified as being aged around 14-years-old and hailing from nearby Bitunia. A Hadassah hospital spokesperson said one of the terrorists was in moderate to serious condition and receiving treatment. The condition of the second attacker was not listed. MDA paramedics described that when they arrived on the scene the 21-year-old victim was lying in the aisles of the supermarket, and the 35-year-old was likewise found between the aisles.